Each year, as I pull out the two large boxes of Christmas decorations, memories flood into my mind and heart. This season of joy and celebration is also one when remembrance brings emotions of all kinds to the fore. When we were first married, Tim and I had a bit of a disagreement about how to decorate the Christmas tree. I wanted everything to be coordinated, with white lights and ornaments of a few, select kinds. He insisted that a Christmas tree should "smile brightly." As in many other things, we've compromised. White lights twinkle through (real) evergreen branches, and the ornaments, of many varieties, smile brightly. Each one holds a memory. There are the ones stitched by friends, the blown glass ball from a local glassblower, the brass bells found on a trip to the mountain town of Riobamba, the angels that took years to complete, and so on. Our tree may never win a decorating prize, but we treasure each ornament it holds. These sweet teapot ornaments; there are three of them, were made by a cousin. I hang them on the china cabinet as they are quite fragile. Just a note about the party - it all went well - there were about 20 of us, fewer than expected because of illness. We had a lovely time and I enjoyed getting to know some of Tim's co-workers better. A busy week is ahead and I may not post again before Christmas, so I wish all of my readers a very Merry Christmas! Thank you for visiting me here. It's such a treat to read your comments. Linking with Mosaic Monday (the last until 2018), hosted by Maggie of Normandy Life. Many thanks to Maggie! thank you for sharing your so beautiful post, you've truly warmed my heart, thank you! Christmas ornaments and decorations hold such fond memories. I wish you a very happy Christmas, Lorrie. never seen that idea before. I love your "compromise"! A tree of memories is just right! We give each of our children a new ornament every year. When they marry and begin their own homes, they take that collection with them. With two girls still at home, our tree is also a collection of memories. I am glad to hear that your party went well! That is an accomplishment! It sounds as if you were very well organized, which I think is key to hosting a big event. I am sorry that sickness diminished your numbers. Lorrie, your tree is lovely. I enjoyed seeing some of your special ornaments. Christmas trees are full of memories. Thanks for the party report -- I knew it would go well. Merry Christmas! Hello Lorrie, I love my tree of memories...more than fifty years of it. Wishing you a very Merry Christmas and a New Year of health and prosperity. Oh that first ornament is so beautiful. You truly have a lovely collection of memories. I'm more of a themed tree kind of person too except that it's never stunning, ha! Christmas decorations though sure bring out my emotions. Different things we made years ago, when we picked them up, and so on. In reference to your party, I bet the guests felt benefits of all your planning and hard work and enjoyed themselves! You'd be a grand host. I love the beautiful themed trees I see online, but ours won't win awards, either! It's full of handmade ornaments, and a hodgepodge of others from travels or gifted to us. Put all together, it has a homey beauty to it that I love. I love that white ornament with the red stitching, so pretty. I love a smiley Christmas tree, but do enjoy white lights on the tree best. As my five children married, I distributed all their ornaments to enjoy on their families'trees. So now my tree is decorated with angels, snowflakes, gold and silver balls collected over the years. One of the gifts, I so enjoyed throughout the year has been your blog. Thank you. Merry Christmas or Happy Christmas to you and yours. I LOVE the cut out! For most of our married life we had a big tree decorated with ornaments collected over the years and the ones that we gifted each child (4 of them) with every year as "their" ornament. As each one got their own home we gave them their own 'special' ornaments for their own trees...and a couple of years ago I put all the other ornaments on big tables and let each kid (by age) go around the table one after another and choose ornaments that held special meanings for them. 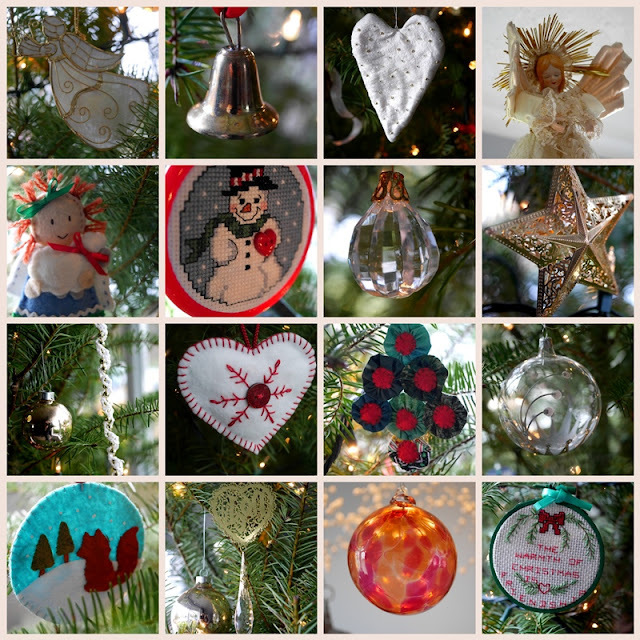 It is so much fun now to go to their homes and see all of our "old" ornaments on their trees. Love that blue 'teapot' ornament!!! I don't think I could ever have a themed or neutral tree. To me the nostalgic ornaments are what makes the tree our tree and beautiful. Have a wonderful Christmas! Hi Lorrie, I love all your decorations. My main Christmas tree is very similar where it holds many memories of Christmas' past. These are decorations that I just can't part with and to even consider not putting them up, well...I feel terrible guilt. So up they go. Your teapot decorations made by your cousin are very unique. I hope you and yours have a wonderful Christmas! Lorrie - I think our husbands would get along - mine says a tree should have 'soul' - so a 'themed' tree is definitely out. This year we took it to the next level of 'soul' by cutting the tree from public lands - it is a bit scraggly, but it's a real piece of Montana. Your ornaments are special, each and every one - what a terrific mosaic! I have treasured getting to know you this year. Thanks so much for welcoming me to the blogging family. Merry Christmas and Happy New Year! I love that every ornament comes with a memory or a story, Lorrie, it give so much more meaning to the decor. Happy Holidays! A tree filled with so many memories is a blessing. Wishing you and yours a wonderful Christmas and best wishes for the New year. More than one tree can be a lovely solution to varied wishes. Christmas trees should hold memories that are rekindled each year - just like yours. May you have a wonderful and very happy Christmas with all of your family. A very Merry Christmas to you and yours, Lorrie! My tree holds memories, too, Lorrie....a lifetime of them! That teapot ornament is just darling, and such a treasure from your cousin. Merry Christmas Blessings to you. Your ornaments are just wonderful, but you know I love that teapot. How clever is that, so very special. Glad your dinner party went well. Merry Christmas to you and your family. Beautiful memories associated with your wonderful ornaments, So glad the party went well. I wish you a blessed Christmas with your loved ones! Your home is so inviting! Dear Lorrie - my thoughts are with you as Christmas arrives. I've been so busy and life has slowed things down for me regarding commenting - but I have caught up a bit now and am loving reading about your preparations for the season. You make everything look so inviting in your home and I'm happy your party went well. Your sis looks lovely on her birthday and O'm happy you were able to visit for the festivities. Have a wonderful, blessed Christmas - and here's to the coming year, may it be healthy, happy and peaceful for all. My good wishes to you and yours this Christmastime. A tree trimmed with homemade ornaments from the heart, is a tree trimmed in love. Having a weakness for snowmen and Santas, my eye darted to your pretty, cross stitched snowman, among all the other seasonal lovelies. Merry Christmas to you and yours, Lorrie. All the very best in health and happiness for 2018. I love your blog and writing and usually check in here and there to view your latest 3-5 posts / commenting on one or two of them.